Perched above white sand dunes facing north, Coastlands boasts majestic views of rolling surf, several off-shore islands, including iconic Whale and White Islands, with the East Cape curving round in the distance, all in the surrounds of this spacious, natural landscape. 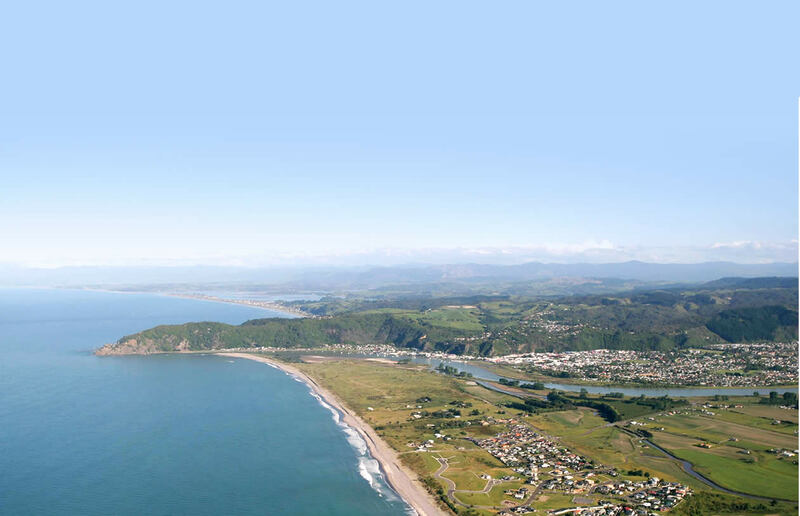 Enjoy miles of beach, walking tracks & cycleway into town from your own beach side land in Whakatane, New Zealand's sunshine capital. Quality neighbourhood, beautiful and high standard of housing guaranteed by realistic building covenants which make Coastlands a great place to retire and enjoy life. Coastlands unique elevation, with high ground behind the dunes ensure most sections enjoy the beautiful blue Pacific Ocean as far as the eye can see. Being just a few minutes over the Whakatane river from Whakatane’s main urban area, located on it’s own beach, Coastland’s has a very tranquil atmosphere, where there is no real ambient noise apart from the birds singing and the soothing sound of the sea lapping the shoreline. Because of the land orientation Coastlands receives views of both the coast and the countryside. The northern sea views take in off-shore islands and the rural views include the Urewera National Park with Mounts Edgecumbe and Tarawera, to the south. Just over the river from Whakatane's main urban area, Coastlands country atmosphere is just a short 3 to 5 minute drive from The Hub Retail Centre, Kopeopeo Shopping Centre and the Whakatane CBD. Children have free buses direct to Whakatane's many public schools, while Coastlands Early Childhood Learning Centre which is on-site, provides quality private education for Pre-School children. Coastlands has become an in-demand area because of its quality environment and friendly, conscientious community. There is a great community spirit here, says Pam formerly of Captain’s Cove, “Its a special community, you feel safe out here. Coastlands is great for children, they socialise in a way which rarely happens in other areas." © Copyright 2014 Coastlands Beachside Estate. All rights reserved.